Now I’m depressed. Keeping this blog going is not an easy task. Not easy for a cruiser that has no job and no desire to acquire a job. Keeping the boat functional is work enough. I had written this blog only to have somehow deleted it, or saved an empty file or restarted the computer. So… here I go again. We were tired of waiting. Minerva isn’t our cup of tea. Maybe if we had planned on hanging there for a month and had everything functioning on the boat it may well have been better. Six to ten hours a day of bouncing around was not our concept of comfort. Not having the dinghy inflated and powered up limited our mobility; not that there were many places to go. Thus, daily we were watching the weather. We download GRIB files twice a day hoping for that magic forecast. We listen to Gulf Harbor Radio (GHR) every am. David is a retired meteorologist that is also a sailor. He broadcasts his take on the sailing conditions in this area of the world from NZ 6 days a week . To date he has not indicated a perfect window for heading where we wanted to go. We wait. With no great sailing window we began looking for a motoring window. Neither of us love motoring. However we both prefer motoring to sailing in storm conditions. The sky didn’t look great this am. There was a rain mass west of us and a little to the north. The winds were….. ZERO. We knew we would have to motor to Fiji if we left today. Fiji was not where we had intended to go but we loved Fiji, the people, the anchorages, the food, all were to our liking. So we would change plans and head there; then on to Vanuatu and New Caledonia. We pulled anchor and motored out of Minerva. Exiting was a non event. The eddies and currents generally in the pass were not there today. We kept motoring. We pointed the bow north right into the dark mass of clouds. While dark it wasn’t worrisome. Ahead the rain appeared to come straight down indicating either wind against us, with us, or non existent. It rained some. The wind was nothing. The autopilot that we connect to the wind vane worked flawlessly. Heading north we listened to the iron gennie (diesel) pound away at the break neck speed of 6 kts. For three days and nights we expected this. Sailboats are not motor boats. We don’t do well when motoring because we roll across the vertical. We lean 5 degrees one way and 3 degrees the other as the waves roll by. Sailing, we heal but the angle stays quite consistent so our bodies adapt quite well. Power boats and especially large powerboats have stabilizers that work to keep the boat from rolling one way and then the other. Our stabilizers are the wind and sails. No wind, no sails, we roll. It was uncomfortable enough I didn’t drag a fishing line. We motored along, reading, sleeping, keeping the boat on course. All was well in our micro world. Everything worked as it should. Close to Fiji things started to change. The water became bluer, there was more life in the sea and the air. We saw birds and of course every once in awhile trash. Two nights before we arrived in Fiji one large storm cell loomed off to the west. W/ was off watch – asleep. I watched as lightening struck everywhere in the Western sky. For the most part we’ve been lucky or I’ve wired the boat correctly. We’ve not yet been struck but with lightening it is always a gamble. I knew strikes have occurred as far away as 60 miles from the storm center. Even when we are a good bit away from the storm the strikes cause concern. I timed the difference between he lightening strike on the ground and the thunder clap. The nearest strike was 10 miles away. Not a comfortable distance but not the worst. After that close strike the storm moved off behind us and we kept getting further and further away. W/’s off watch was over and I updated her on the situation. I went below to sleep. The following day we spoke with sv Second Wind. They left a couple hours after we did and were not as lucky. The storm moved right over them. Yet as most often the case they had no damage. Both of us were heading to Fiji. The following day we hoped for a good night’s rest; one without the constant boom, boom, boom of a diesel running. And as in Minerva, offshore I check the wx every day. There was to be a glob of 35 kts of wind between Fiji and Tonga that we wished to avoid. While we had 3 potential landfalls; Denerau, Suva, and Savusavu the nearest safe harbor from this “crap” was Suva. We choose the nearest option. The day dragged on as we were closing in on Fiji. We could now hear VHF communications and we were too fast. I know that is an oxymoron considering we travel about the speed of an average jogger. But at the speed we were going we would be arriving at Suva in the dark. While Suva is a commercial harbor we don’t want to enter a developing nation’s harbor at night – the first time. Any navigational marker broken would be a problem for us. The smaller fishing boats used by individuals in Fiji often don’t run or even have lights. Given the possibiliity of arriving earlier then we want we try to slow down. When I feel a little puff of air on my face I said “Let’s sail”. What a joy it is to turn off the engine and let mother nature move our boat. The calm serenity of Elysium moving through the water under the power of the wind is what our soul desires. We weren’t going fast, 3- 4 kts but we were moving. And move we did for about 3 hours. Then the breeze died and the sails hung like the dead. The sails furled we start the engine. 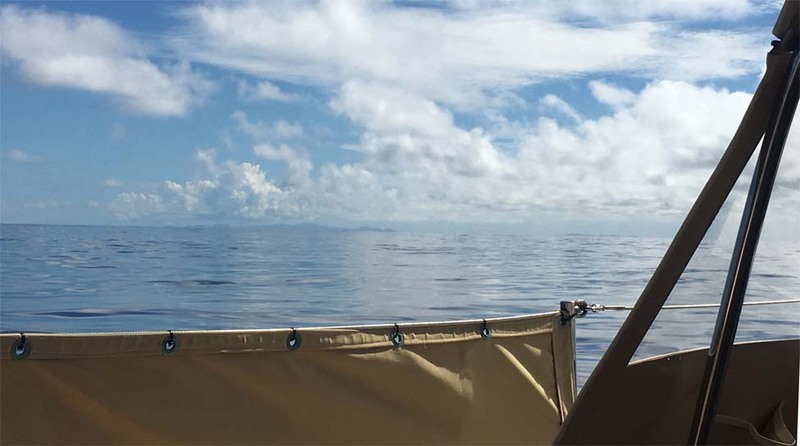 We motored slowly towards Fiji but we would still be too early. As night descended and as we closed on Fiji we decided to lay ahull. We shut the engine off and floated for a few hours. I calculated the time we would need to arrive in Suva in light and we waited. We still keep watch even though we are not moving. You never know what can happen out here. I am always amazed at how many times on the open ocean we’ve had to change course to avoid another ship. In many cases we would have the right of way. But, we never play chicken with ships. NEVER. Late night we start up the diesel; again, and motor into Suva Harbor. We arrive at dawn. Anchored; we call the Suva Yacht club. They provide the service for the officials to come to the boat. They then inspect the boat, check us over (visually), and provide the paperwork for us. We are now legal to be here. Before noon we are legal. Oh do we look forward to a good night’s sleep. Little did we know.